I got stuck on this idea of St. Louis neighborhoods that are built out. Meaning, no remaining vacant lots for new development. I dreamed of the fact that if certain neighborhoods are “done”, then developers are going to have set their sites on other long neglected neighborhoods. The DeBaliviere Place Neighborhood, just north of Forest Park is a highly desirable location. Close to Central West End, Skinker DeBaliviere Metrolink station with access to both the blue and red line, The Loop, The Loop Trolley, etc. You can’t beat this part of town. So when I learned of yet another multi-level apartment building along Pershing Avenue, I was thrilled. 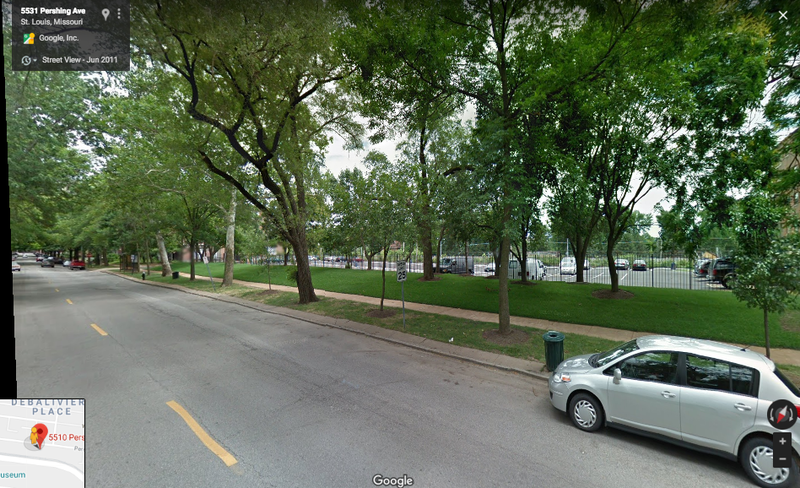 Could DeBaliviere Place be one of those rare St. Louis places that is on the verge of “fully developed”? It’s worth exploration and a long scooter ride to study it…Spring is right around the corner. I read about this proposal on NextSTL back in February, 2018 and they’d been reporting on rumblings of this development since 2015. I’m adding it to the 2018 favorites list because of the momentum this block has seen in recent years. The same developer recently completed the Tribeca Apartments across the street and it looks great from both Pershing and Forest Park Parkway, which is one of the most big-city views we have from the vantage point of a car window. Tribeca’s 160 units and nice urban form, set back slightly from the sidewalk and street, but blending well with the brick beauties on each of its sides…it works! Say what you want about modern building materials, but this is such an improvement over the surface parking lot that was here devaluing the neighborhood of its big city feel. 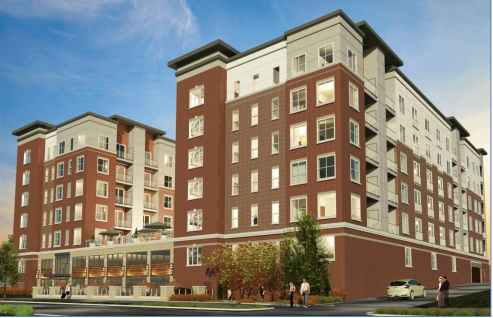 The Ranier One apartment proposal across the street should have a similar impact. The project will replace a once private swimming pool and tennis courts now turned ratty surface parking lot into a 7 story building with structured parking, 3rd story outdoor area, ground floor retail opportunity and 79 one bedroom, 25 two bedroom, 7 three bedroom and 38 studio apartments. Here’s what the former rec area, now surface lot looks like as of publishing. 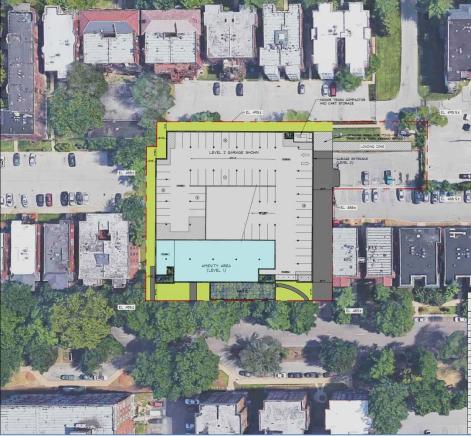 The April, 2018 Preservation Review Board agenda had some encouraging information from the Cultural Resources Office who recommended the removal of a curb cut for below-grade parking access, favoring use of the already existing drive, allowing access on the east elevation of the building. The Riverfront Times reported in September, 2018 that a locally owned restaurant, the Kitchen Sink will be opening in the second storefront pictured above. One of the other strength of this neighborhood is the tree-lined streets. This is a prime example of how trees can change the vibe of a neighborhood. Could DeBaliviere Place be moving toward one of the highest density places in our fair city? The news is good in this part of St. Louis, and if you keep reading these best of 2018 posts, you will find more reasons to be excited about the western edges of St. Louis…stay tuned.